This college football season, The Alliance has the privilege of being the official corporate sponsor of the coin toss prior to home games at NC State in Raleigh, N.C. On Thursday night, a group of The Alliance will be at Carter-Finley Stadium as the Wolfpack host Louisville and the reigning Heisman Trophy winner Lamar Jackson on national television. Before the game, three members of The Alliance will be on the field and will walk out to midfield with the captains of both teams to supervise the coin toss while The Alliance logo is prominent throughout the stadium. “Have Fun, Make Money, Make a Difference” can be seen from anywhere in the stadium. People listening to the game on the Wolfpack Radio Network will also hear about The Alliance during its pregame broadcast. 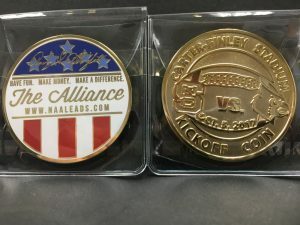 As a special wrinkle, we designed a series of “Kickoff Coins” unique to each game. One side features The Alliance logo, while the other has the date of the game and the logos of both teams. This was our way to do things first-class and the coins have been a big hit with coaches, fans and our guests at the games. Thursday night, a special group of our President’s Club contest winners will be attending the game. Terry Edwards, Adam Johnson, Mickey Crews and Mark Hutcheson each won a cash prize, a pair of tickets to the game and a commemorative coin for their hard work in the month of September. The game is being aired nationally on ESPN at 8 p.m., so I hope that you will tune in. You might just see us on the field before the game! There are two more games this season for our President’s Club members to have a shot at winning a prize package in the month of October to attend home games in November. The Wolfpack hosts defending national champion Clemson on Nov. 4, and close out the home slate against in-state rival North Carolina on Nov. 25. To find out more about how you can win, please contact Matt Mason at [email protected]or [email protected]. The Alliance is proud to be a corporate sponsor of NC State football. It has been a blast to be on the field at the home games so far, and the best games are ahead of us in terms of the matchups.